The last two posts presented you with radio show suggestions for the weekend (one on Saturdays, one on Sundays). In this post I can suggest a radio show program which airs on weekdays, coast to coast to coast. Again, this is a Radio-Canada program, and thus you should have little difficulty finding radio coverage where you reside in the country. The last post I provided you with maps of Radio-Canada FM coverage in Western Canada. 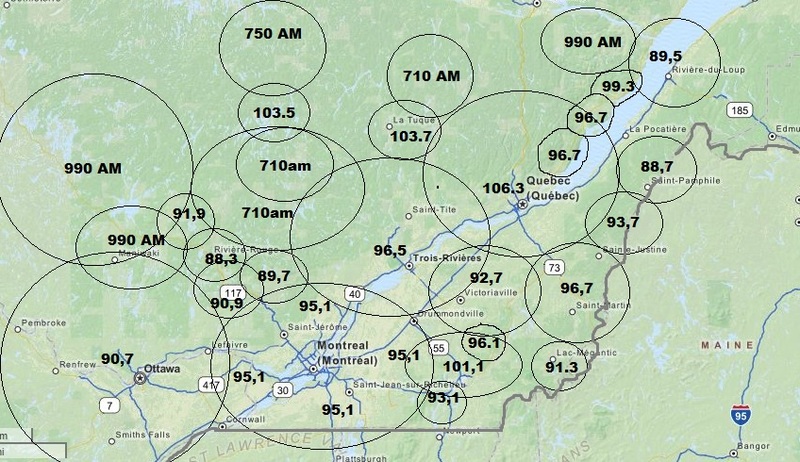 Below is a map which provides you with French-language Radio-Canada FM coverage in Eastern Canada. 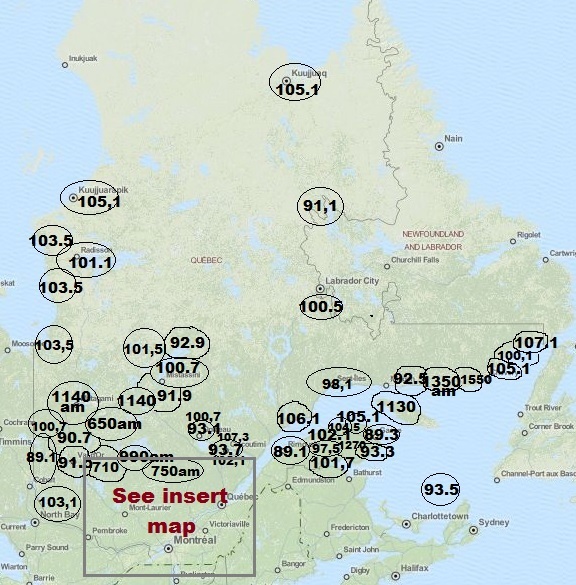 As you can see from this post and the previous, Radio-Canada has a HUGE network radio network across Canada (and this does not even include the three Northern Territories of Yukon, NWT or Nunavut). It is physically one of the largest radio-networks in the world. For Anglophone Canadians, having this sort of 24/7 resource at your fingertips, at the turn of a dial anywhere in the country is une ocassion en or (a golden opportunity) to learn more, to improve your French language skills, and to get a better sense of what a whole other aspect of the country is about. If you think of it, it sort of takes away the excuse that a person doesn’t have the opportunity to “be exposed”. “Pas de midi sans info” is a weekday current affairs radio magazine program try to keep readers up-to-date on major and relevant happenings within a day or two of the broadcast. At times it discusses on local subjects in Québec, and other times it discusses national issues. It does not touch as much on International subjects as the previous two weekend programs I mentioned. Topics are varied, but politics tend to be a staple. This is one program from which I often learn new bits and pieces of information. Take yesterday’s show for example: I was listening to the program in the car while driving to the Canadian National Exhibition to take in a CF18 airshow. They were talking about journalists who had left their journalism careers and made the transition to politics. What I did not know is that there is a journalist ethics code which all journalists must sign in Québec which states that once you leave for politics, you are not to be rehired as a journalist. You can always be an invited commentator, but media outlets are not to re-hire you. I had previously heard mentioned that “journalist careers of forever finished if they enter politics”, but I thought that was more metaphorical than anything else, until yesterday’s program. There are THREE ways to listen to Pas de midi sans info. You can listen to it live on Radio-Canada Première every weekday (Mon-Fri)unday from 12:00 noon to 1pm. It’s a weekday… listen to an episode and see how this program sits with you. By Quebec Culture Blog 101 in Uncategorized on September 8, 2015 .